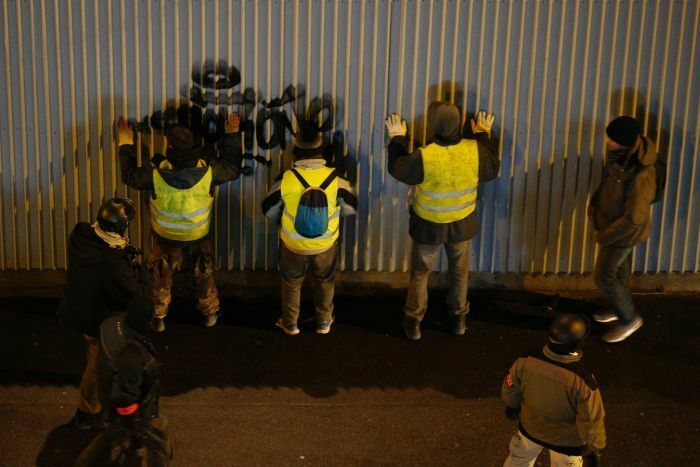 A string of private and civic bodies are beginning the big clean-up in Paris, a day after running battles between yellow-vested protesters and riot police left 71 injured and caused widespread damage to the French capital. The man at the focus of protesters’ anger, President Emmanuel Macron, broke his silence to tweet his appreciation for the police overnight, but pressure mounted on him to propose new solutions to calm the anger dividing France. A spokesman said Mr Macron would address citizens early in the week. The number of injured in Paris and nationwide on Saturday was down from protest riots a week ago, and most of the capital remained untouched. Still, footage of the violence in famous Paris neighbourhoods broadcast around the world has shaken the country’s image. France deployed some 89,000 police but still failed to deter the determined protesters. Some 125,000 “yellow vests” took to the streets on Saturday around France with a list of demands related to high living costs, the perception that Mr Macron favours the elite, and that his Government’s economic modernisation is too fast. Some 1,220 people were taken into custody around France, according to the Interior Ministry, in a roundup the scale of which the country has not seen in years. French police frisked protesters at train stations around the country, confiscating everything from heavy metal petanque balls to tennis rackets — anything that could be used as a weapon. The Eiffel Tower and Louvre Museum reopened on Sunday after closing due to rioting. Shops assessed the looting damage on Sunday and cleared out broken glass, after shutting down for a day in the height of the holiday shopping season. Wind and rain pummelled Paris overnight, complicating efforts to clean up the debris left by protesters, who threw anything they could at police and set whatever they could on fire. By Sunday, expired tear gas canister lids lay scattered on the cobblestones of the usually elegant Champs-Elysees. Protesters ripped off the plywood protecting Parisian store windows and threw flares and other projectiles. French riot police repeatedly repelled them with tear gas and water cannons. 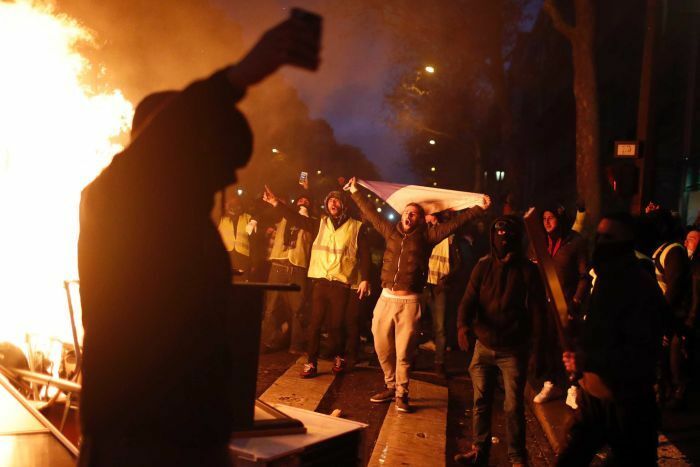 Most of the “yellow vest” demonstrators in Paris appeared to be working class white men from elsewhere in France, angry at economic inequalities and stagnation. “What happened yesterday and the Saturday before, it was unforgettable,” said Jean-Pierre Duclos, who told reporters he was against the yellow vest movement. Police and protesters also clashed in other French cities, notably Marseille, Toulouse and Bordeaux, and in neighbouring Belgium. Some protesters took aim at the French border with Italy, creating huge traffic jams on Saturday. Some 135 people were injured nationwide, including the 71 in Paris. Seventeen of the injured were police officers. Jean-Claude Delage, of the Alliance police union, urged the Government to come up with responses to France’s “social malaise”. He told BFM television that working-class protesters were deliberately targeting high-end shops in Paris that were selling goods they could never afford. Saturday’s protests were a direct blow to Mr Macron, who made a stunning retreat last week and abandoned the fuel tax rise that initially prompted the “yellow vest” protest movement a month ago. The President’s turnaround damaged his credibility with climate defenders and foreign investors and earned derision from US President Donald Trump, an opponent of the 2015 Paris climate change accord that Mr Macron has championed worldwide. Yet it did nothing to cool tempers of the “gilets jaunes”, the nickname for crowds wearing the fluorescent “yellow vests” that all French motorists must keep in their cars. The disparate movement now has other demands, from taxing the rich to raising the minimum wage to having Mr Macron hand in his resignation.